The below video is just further proof that the LEFT has completely and totally lost their mind. And also, how the mighty in their mind’s has fallen. Keith Olbermann stayed up all night and came up with the following idea, “We can still delegitimize Trump by not calling him “President Trump”. Wow Keith, you are brilliant. 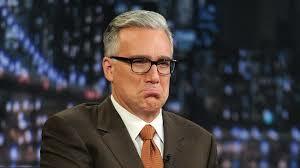 Olbermann and his ilk are a perfect example of if you do not first succeed, cry, cry again. The LEFT just does not get it. Keep calling those who voted or supported Trump as stupid and cretins. Go ahead, I dare you. Keep dismissing the vast number of Americans who don’t live in New York City and California. Your idea of resistance is foolish. Resistance actually means not slapping you upside your liberal, arrogant, elitist head. That is what resistance means Keith. Oh, by the way, nice cardboard set you have in your video, are you serious? Let the moonbats keep yapping. Freedom of speech is a great thing. It shows, as in the case of a loon like Olbermann, that the people got it right in electing Trump rather than anyone that would support the likes of Clinton. As reported at THR, television personality Keith Olbermann and ESPN are parting ways for a second time. It turns out that Olbermann is even too liberal for what I like to refer to now as LESPN, liberal entertainment sports programming network. ESPN is looking to cut $100 million from next year’s budget and $250 million from 2017′s budget. According to BI, network executives had asked Olbermann to ditch his leased Times Square studio, where his program is produced for ESPN2, and either move to the network’s headquarters in Bristol, Connecticut or to Los Angeles, However, the biggest sticking point appeared to be that as a part of an extension of his 2 year deal, the network wanted him to stop offering commentary on his program. What, Olbermann not allowed to spew his venom? No way, that was a deal breaker. But when one thinks about it, opinion commentary and criticizing sports hardly seems like a money maker for those in the sports entertainment industry. Especially when these days ESPN is not the only game in town. Keith Olbermann is exiting ESPN once again. The television personality, who rejoined the sports network in August 2013, won’t be renewing his deal to anchor his ESPN2 program. The news follows a THR report on July 1, noting that ESPN management floated an ultimately unworkable caveat: that Olbermann cease engaging in commentary. The NY Daily News is reporting that Keith Olbermannn may be returning to ESPN. Olbermann worked at ESPN from from 1992 to 1997 and has expressed recently wanting to return. Are you kidding? Obviously the suits at ESPN have forgot what an obnoxious nuisance and PITA that Olbermann was when he first worked there. 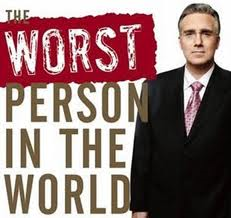 Hey ESPN, have you forgot when Olbermann referred to ESPN’s Bristol, CT headquarters as a “godforsaken place?” Some how this lib is a sought after talent after being ousted from MSNBC and Current TV, Really? I think this tells us more of the direction of ESPN that it does Olbermann. Seriously, why would a network supposed to be about sports hire a liberal moonbat? Count me on the list of watching alternative sports networks if this is the direction that ESPN plans to go. So this is ESPN’s response to Fox’s August launch of Fox Sports 1? The Daily News has learned the Worldwide Leader is in serious discussions with Olbermann to host a New York-based late night talk show on ESPN2, according to industry sources. The sources said the situation was still “very fluid” and no decision on green-lighting Olbermann or the project had been made. If the move is made, it could blunt the buzz Fox hopes to generate with its August launch of Fox Sports 1. This could be the first shot in an all-sports cable TV war. The sources added that ESPN is also considering unleashing a multimillion-dollar “SportsCenter” advertising campaign/counterattack that would air around the launch of FS1. Still, the timing of an Olbermann hire would be strange. Last month, Turner Sports hired him to host its Major League Baseball postseason studio show on TBS. So this is what ESPN thinks is going to restore their viewership, after so many other networks, including NBC and FOX creating competition with sports networks? They have been raiding ESPN’s talent of late in an effort to challenge ESPN for market share. It just goes to show you though that TV exec’s have to be among so of the most stupid individuals alive. Who on early would rehire such a malcontent like Olbermann and some one who is so polarizing with his liberalism. Why would anyone hire some one where automatically 1/2 of America would not watch. ESPN boss John Skipper and the rest of the suits might be the “worst person in the world”. UPDATE I: Hire Olbermann, but this was the same network who chastised PGA golfer Paul Azinger who criticized President Obama for playing to much golf? And felt the need to apologize for long time sports announcer Brent Musberger’s comments about Miss Alabama Katherine Webb during BCS Champ broadcast … “You quarterbacks, you get all the good looking women. What a beautiful woman… Whoa!” Yet they will hire and walking-talking lighting rod for ignorant and inflammatory comments?